This is a review of the VonShef Premium 8 Liter Sous Vide Water Oven. The VonShef is a smaller capacity sous vide machine that will still cook your food to an excellent standard. It is priced well, and you will get very good sous vide cooking results from it. The VonShef is a self contained unit and the water bath can hold up to 8 liters. You will be able to cook up to 6 pouches of food at a time, and for the average home chef this should be enough for that special meal. You will be able to cook a variety of foods with the VonShef. Meats, vegetables, fish, eggs and fruit can all be cooked well using this suvee cooker. 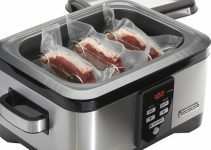 You will need to use sous vide bags of a standard size to add the food to be cooked. These will then need to be vacuum sealed. A sous vide vacuum sealer does not come with the VonShef, but there are plenty around that will do the job. It is really simple to use the VonShef. It has an LCD display that is very clear and buttons to set both the temperature and the time. The cooking temperature can be set from 0°C to 99°C and there is a 1 minute to 24 hour timer. Setting the time can be done in minutes or hours and minutes which is better than having to work just in minutes, which other cookers make you do. The manufacturer of the VonShef has not published any temperature stability figures, but a number of tests on this sous vide equipment have revealed it to be around ±0.5°C, which is good enough to achieve fine results from your suvee cooking. 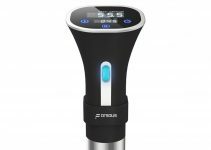 It is a fairly compact sous vide machine and it measures 15 inches by 9 inches by 10 inches. This is smaller than a lot of the other self contained commercial sous vide machines and should be fine in most kitchen settings. It weighs less than 12 pounds, and it is pretty easy to carry it around thanks to the recessed handles at the side. These also make emptying the water cooker pretty easy as well. The VonShef water oven looks good with its black and chrome color scheme. A detachable lid is provided and this has a transparent view section where you can watch your food being cooked if you wish. The lid also minimizes water evaporation and you could use it as a tray to carry your uncooked or cooked food pouches. Inside the VonShef there is a removable rack that separates the pouches of food and prevents them from touching the bottom of the unit. There are slots for up to 6 food pouches. If the rack is removed it is possible to cook larger items. Water heats up pretty quickly in the VonShef and the smaller capacity should save on your energy consumption. The VonShef also comes with an extended warranty of 2 years, which is good when you consider that most of the competing sous vide equipment only comes with a one year warranty. 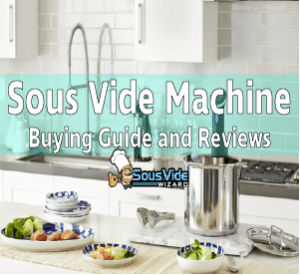 This suvee machine will provide you with similar high quality cooking results to those of much higher priced machines. The VonShef is usually available for under $200, so if you are on a budget but still want to cook gourmet meals then it is a very good option. It really couldn’t be simpler to use the VonShef. The LED display very clearly shows the cooking temperature and the time remaining. The controls are positive and responsive, and the ability to set the cooking time in hours and minutes means that you do not have to waste time calculating the total number of minutes. The temperature stability tests make the VonShef machine perfect for sous vide cooking at home, as you can set it up and then walk away and do other more interesting things with your life. The stainless steel pouch rack and removable lid make everything very convenient. You will need to put your food in the recommended bags and then place them into the rack. Put the lid back on and set the desired temperature and cooking time. So simple a child could do it. Because of its lower capacity water bath and the way that the VonShef is engineered, it heats the water considerably quicker than other self contained water ovens. It uses less energy than other suvee machines as well, so you will save money on power usage. The VonShef is almost silent when it is cooking and it will not disturb you if you are doing other things around the kitchen. This is all the more amazing when you consider that the VonShef has a water circulation pump, and does not use convection like other sous vide machines do. A small footprint and good styling will make the VonShef look good in your kitchen. A lot of competing self contained suvee cookers are a lot bulkier, which is mainly due to their large capacity water baths. The black and chrome effect is very stylish. When you take into account that most of the other self contained sous vide machines have cooking times up to 99 hours, this can viewed as a pretty significant limitation. The thing is that a lot of sous vide cooking can be performed within a 24 hour time frame so it really depends on how ambitious you plan to be. You have to weigh up whether you want to pay quite a lot more money for the convenience of longer cooking times (and a larger capacity water bath). It is likely that the VonShef will be adequate for most home cooks. A few users have commented that the build quality of the VonShef is not as good as the higher priced suvee cookers. The manufacturer offers a 2 year warranty with the cooker so they must be confident in the quality. Again it comes down to what you are prepared to spend. The manufacturer of the VonShef has not stated whether the appliance has been tested and certified to UL home use standards. 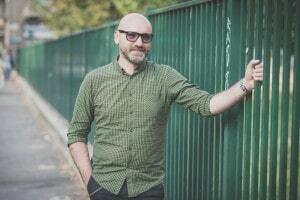 There have been no safety complaints from users to date, and it is unlikely that the big stores would accept a product that is not safe to use. 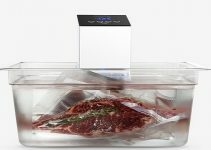 The VonShef brings self contained sous vide cooking to those on a budget. It produces very good cooking results that are equivalent to those produced by larger and more expensive cookers. This is a best sous vide machine for home use, and should have enough capacity for the average family. It is offered at a great price, and if you want to start cooking gourmet meals for your family then the VonShef is for you.